Happy National Italian Cheese Month! If you weren’t aware, September is National Italian Cheese Month. September is also recognized as National Preparedness Month, Hispanic Heritage Month, and National Blueberry Popsicle Month, among others. September also marks Pulmonary Fibrosis Awareness Month. Pulmonary Fibrosis (PF) refers to a group of respiratory diseases characterized by scarring of the lungs and difficulty breathing. Although some forms of PF are idiopathic (no known cause), many are related to occupational exposure to dusts, fibers, and fumes. Asbestosis (asbestos), silicosis (crystalline silica), and anthracosis (coal dust) are just a few examples of the “dusty lung” diseases. The insulation industry has made great strides in protecting workers by manufacturing safer materials, providing better ventilation, and using safer work practices and control measures to keep dust out of the air during insulation work. In some cases, it is also necessary to put workers in respiratory protective equipment to prevent exposure to airborne dusts. The Occupational Safety and Health Administration’s (OSHA’s) respiratory protective equipment standard is one of the most frequently cited standards every year. It’s not as simple as handing your employees a respirator when they are performing a dusty task. There are a lot of regulatory hurdles to clear to comply with the rule and to ensure your employees are being properly protected. To begin with, any employer with employees using respiratory protection must have a workplace-specific, written Respiratory Protection Program and a Program Administrator responsible for the program. 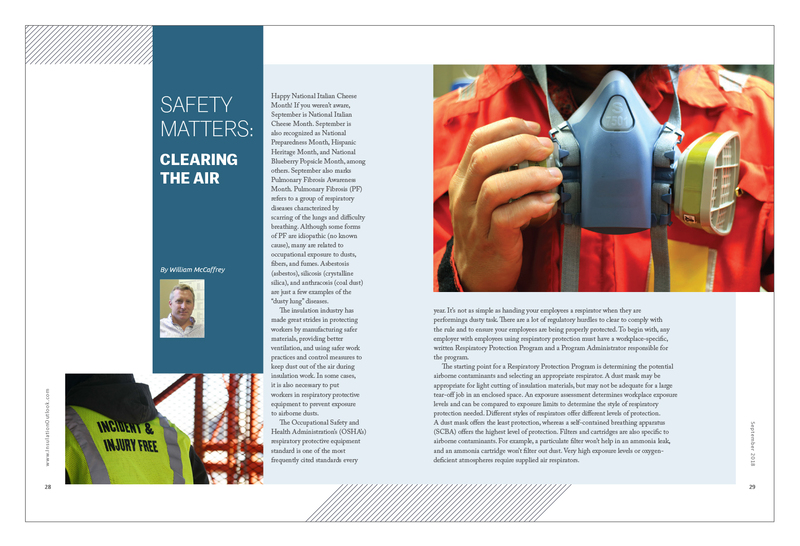 The starting point for a Respiratory Protection Program is determining the potential airborne contaminants and selecting an appropriate respirator. A dust mask may be appropriate for light cutting of insulation materials, but may not be adequate for a large tear-off job in an enclosed space. An exposure assessment determines workplace exposure levels and can be compared to exposure limits to determine the style of respiratory protection needed. Different styles of respirators offer different levels of protection. A dust mask offers the least protection, whereas a self-contained breathing apparatus (SCBA) offers the highest level of protection. Filters and cartridges are also specific to airborne contaminants. For example, a particulate filter won’t help in an ammonia leak, and an ammonia cartridge won’t filter out dust. Very high exposure levels or oxygen-deficient atmospheres require supplied air respirators. Training is another important element of a Respiratory Protection Program. In addition to instruction on how to wear, inspect, use, and maintain the respirator; training should include why the respirator is necessary, and the consequences of not properly wearing or maintaining the equipment. Another important training point is that employees wearing respirators must be clean shaven. Even a little bit of stubble prevents the good face-piece seal necessary to filter out the harmful dust that can cause lung disease. Training is required to be completed before an employee uses a respirator in the work area and must recur at least annually. Because respirator use may place a physiological burden on employees that must wear them, medical monitoring is required for a Respiratory Protection Program. Employees must be evaluated by a physician or licensed health care professional (PLHCP) to determine each employee’s ability to safely use a respirator. Lung disease, heart conditions, and even claustrophobia can all prevent an employee from being able to use certain respirators safely. The medical evaluation starts with a medical history questionnaire completed by the employee. Based on the PLHCP’s review of the questionnaire, a follow-up examination may be necessary. Employers must keep record of the PLHCP’s medical clearance record for each employee wearing a respirator [Note: The medical evaluation requirement does not apply to those employees who wear dust masks on a voluntary basis]. Additionally, each employee must be fit tested for each make, model, and size of respirator they will be required to wear. Not surprisingly, respirators are not “one size fits all.” A respirator that is too big or too small will not offer adequate protection. A respirator fit test determines if a particular size and style of respirator fits the employee. One common technique is the isoamyl acetate protocol (i.e., the banana oil fit test). An employee performs a series of exercises wearing their respirator while being exposed to the banana oil. A properly fitted respirator should effectively filter out the banana odor. If the employee can smell bananas at any time, it indicates that the respirator does not fit properly. They would need to retest with a different size or a different model until they passed the fit test. Fit testing must be repeated at least annually. In honor of Pulmonary Fibrosis Awareness Month, reevaluate your work areas and determine if you are doing everything you can to keep dust out of the air. 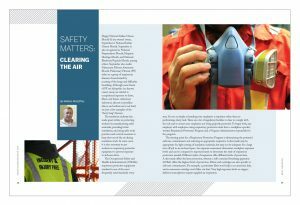 When engineering controls, work practices, and other control measures do not completely eliminate the hazard, implement a Respiratory Protection Program and provide respiratory protection to your employees. Help knock out PF and keep your employees healthy so they can enjoy Italian cheese and blueberry popsicles in the month of September.